Little Bird Lost is a literary labor of love brought on by a lucky encounter. Steve Larkinson happened upon a nest with some baby birds and was able to capture some winning photos of a mother and father bird caring for their little ones. 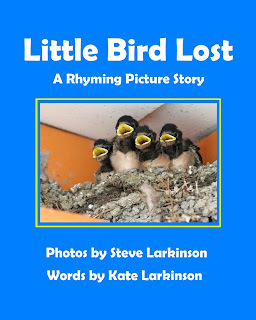 Inspired by these photos, Kate Larkinson penned a lovely poem which is perfectly paired in this wonderful little book. Delightfully uncomplicated, remarkably simplistic, Little Bird Lost is likely to warm the hearts of readers young and old as they witness the love and care exhibited for four little birds. Little Bird Lost is recommended for home and school libraries and has earned the Literary Classics Seal of Approval. Thank you for your lovely review and seal of approval. Very much appreciated!